Plenty of delicious meals are available to home cooks who want to prepare Italian recipes. 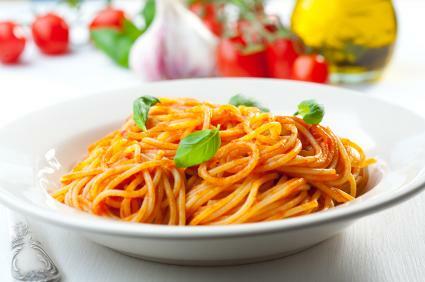 Many Italian dishes often include pasta but can use other ingredients such as vegetables, chicken, and fish. Pasta is the basis for many Italian recipes and comes in a wide variety of shapes and sizes. Spaghetti and macaroni are the most common, but penne, long cylinders of pasta, and shell-shapes that are stuffed are also widely used. Most Italian recipes call for pasta that is cooked al dente or "to the tooth." That is, the pasta should not be so soft that there is nothing to chew, but cooked enough that there is no dryness in the center. When you boil the pasta, stir the noodles shortly after you put them in the water so they do not stick together. Unattended pasta in water will bond together in a sticky mess. Sauces play an important role in Italian cooking. Marinara sauces are quick and contain only a few ingredients, whereas a traditional tomato sauce is more complex, smoother in texture, and requires a much longer cooking time. 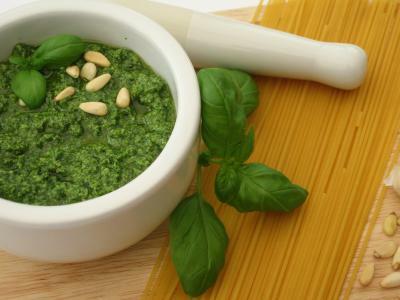 Other sauces include Alfredo, which is a creamy sauce, and pesto, which is a blend of ingredients such as basil, nuts, parmesan cheese, and garlic. 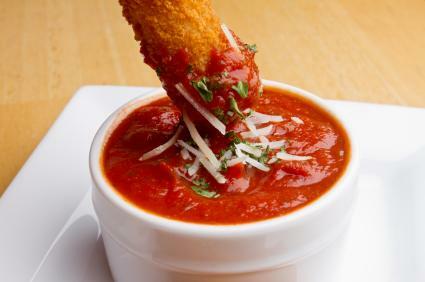 Sauces can be used not only for a pasta dish but as a dip or as a topping for a vegetable. Try this recipe for a classic marinara sauce. Over medium heat, heat olive oil in a large saucepan. Chop garlic cloves and add to the oil. Cook garlic for 1-2 minutes or until lightly brown. Add tomatoes and liquid to the oil and garlic. With the back of a wooden spoon, crush the tomatoes until they are broken up into smaller pieces. Once mixture has thickened, add the fresh basil and cook for another 5 minutes. Season with salt and pepper and adjust seasonings to your taste. Another type of sauce is a pesto. This versatile sauce can be served over pasta or steamed vegetables, or spread on fresh bread or toasted baguettes. In the bowl of a blender or food processor, combine the basil leaves and pine nuts. Pulse until combined and then add in the garlic. While the food processor is on, drizzle in the olive oil until is it combined. Stop the processor to scrape down the side and continue pulsing. Add the cheese, salt and pepper and combine with the other ingredients. Taste and adjust the seasonings if needed. The perfect accompaniment to an Italian dish is a savory side or a refreshing salad. Soups can be served as a first course or even as a main course. Soups are often hearty and served with fresh bread. Some popular soups include minestrone and wedding soup. Salads can be enjoyed as part of the meal or even as a light lunch or snack. On a large platter, alternate mozzarella slices and tomato slices. Make a circular design and overlap each ingredient. Tear fresh basil leaves and sprinkle liberally over the slices. Add salt and freshly ground pepper over the top. Before serving, drizzle over the top some extra-virgin olive oil. Italy is made up of many distinct cuisines. Each region has their own dishes and ways to prepare dishes. Basil: This fresh herb can be used fresh or dry and has a slightly sweet taste. Basil is more prominent in dishes from the Genovese region of the country. Thyme: This herb will add a sweet, almost licorice flavor to foods. Thyme is used throughout the Mediterranean and is grown around Italy. Oregano: This is herb is used in sauces and pairs well with dishes containing tomatoes. It has a slightly strong flavor making it recognizable. Oregano grows throughout Italy and is common in all regions. Garlic: Fresh or dried garlic is used in almost every dish. It gives a pop of flavor to virtually any meal. Garlic is a staple in all Italian dishes. Almost every region uses it in their recipes. Butter: Butter is used in northern Italy where olive trees are not prominent. Olive oil: In central and southern Italy, as well as Sicily, people use olive oil in their recipes rather than butter. Cream-based sauces: Northern Italy cooks make dishes with creamy sauces whereas in the south, you will find more sauces prepared with olive oil and tomatoes. 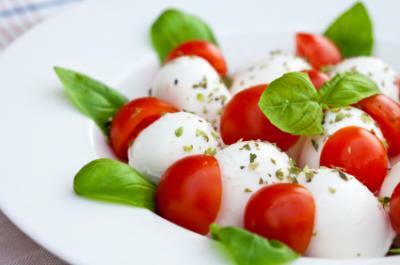 Most Italian recipes use fresh ingredients and what is available for that season in your particular area. If you are using a recipe and do not have a specific ingredient on hand, feel free to substitute with something else that is similar. In Italy, cooks use what they find at the market on a given day and enjoy eating a variety of food. Stock your pantry with basics such as canned tomatoes, dried herbs, dry pasta, olive oil and garlic and you can prepare an Italian meal with little hassle and effort.